Seattle’s forested parklands need your help! Come out on November 3, 2007 and join over 500 citizens, businesses, nonprofit organizations, and community groups to celebrate the 2nd Annual Green Seattle Day. Plant a tree and join the fun at your favorite Seattle park. The main site will be at Interlaken Park, but there are also 16 other sites throughout the city where you can get involved. To find a park near you visit http://www.greenseattle.org/. Individuals and small groups can register with the contacts listed for each site. For general information or to register a group of 15 people or more please send an email to: info@greenseattle.org or call 206-905-6920. Donate to the Green Seattle Partnership today and HomeStreet Bank will double your gift. Cascade Land Conservancy is proud to be a partner of HomeStreet Bank’s Tree Challenge from September 15 – November 15, 2007. Through the HomeStreet Bank Tree Challenge, HomeStreet Bank will match contributions dollar for dollar to help build and maintain a healthy tree canopy in our region. Visit http://www.cascadeland.org/support-us/homestreet-tree-challenge to make your donation today! MONROE, WA : The Monroe Correctional Complex’s new IMU (Intensive Management Unit), which opens January 8th, is the first prison unit in the state to be certified as “green” by the U.S. Green Building Council. DOC officials believe it may be the first such cellblock in the nation. It cost $39.5 million to build and will hold 200 men. It may cost a little bit more to build, but over the life of the building it ends up costing less, as is the case with most green buildings. Interestingly, the Times article makes no mention of the green features of the facility. I got a hint Thursday night at the HOA meeting that it was going to be announced in Las Vegas on Friday (last) that High Point was one of five projects this year to win the Urban Land Institute’s Global Award for Excellence. Today the news hit the Seattle PI so I figured it was safe to talk about it. The ULI’s priority, “Sustainable Communities”, is embodied in the new developement of High Point in West Seattle. I am such a believer in this neighborhood effort my husband and I sold our home 12 blocks away and moved here ourselves in August. I admit, new construction is nice. But I moved here because the community is walkable, well lit, beautiful, environmentally sensitive, architecturally interesting, and the people here are friendly. The people who live here also believe in the concept of neighborliness, not strangers like my last neighborhood. We met more new friends in the first week we moved here than in 6 years at our old home south of Puget Ridge. You can hear more of my “It’s about time…” speech on Monday, November 5th, at 10 AM. Mayor Nickels will be at the View Point (pictured above) accepting this amazing award on behalf of High Point and the Seattle Housing Authority. Lots of VIPs will be there. And I was asked to speak, as a resident of High Point. 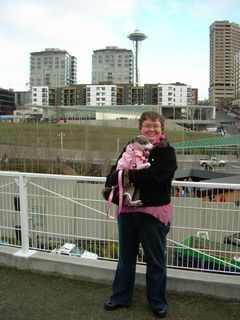 It might be the first Seattle speech ever accompanied by a 4-legged visual aid – my Italian greyhound, Sophia. I am so grateful I was able to find a great neighborhood without having the leave my beloved community of West Seattle. If you happen to come to the award ceremony on Monday, be sure to say hi to Sophia and I! Read the press release here and more about the High Point development on the Urban Land Institute’s web site. Too cute for words! I love looking at the homes on this street when walking my dog every day. I live just a couple of blocks away from this beautiful 2 bedroom, 2.5 bathroom, 1,680 sf 2006 Built Green & Energy Star home in High Point in West Seattle. Click here for the full photo gallery and more information! Click “See Additional Pictures” under the photo after following the link. And as always, let me know if you would like a personal tour!! I’ve not mentioned it before, but I am taking the first ever offered “Green Real Estate” class in Washington. It’s being held at North Seattle Community College. When I am done I will be a Certified Built Green Professional and have 30 more clock hours for the bi-annual RE license renewal! NEWS FLASH – they are calling for students for next quarter. It’s not actually scheduled but the demand has been so high, they are considering offering it again in January. Email me if you want to be put on a notice list should they offer the class again. There are a lot of real estate professionals in the class, but there are also a lot of builders and developers – and individuals who want to do their own green remodeling – in this class of over 50 adult professionals. ANYway, we enjoyed a very interactive presentation with Chuck Wilson, a local distributor of PolySteel, an ICF product. This was not something I was very familiar with, Insulated Concrete Forms. Fascinating stuff! Highly insulating, very strong, (would hold up to that blasted storm of last December, even if a tree hit it), and here’s the creative part of me jumping for joy – it can be made into any shape. You can have curved walls, you could float shelves or benches into the walls – the possibilities are endless. A three story home is common – and they have built apartment/condo buildings up to 9 stories high. He assured us it’s not difficult to work with – you could even build your own, since much of it comes precut from the factory. I encourage you to visit the PolySteel web site to learn more about this building material and how it works. American PolySteel, LLC, is the oldest manufacturer of insulating concrete forms in America (since 1978), and pioneered an industry that now boasts 50 products and builds thousands of homes and commercial structures each year. What a great presentation! I was in rapt attention for over 90 minutes and the questions asked by everyone in the room led to very animated conversation! You would never know an ICF home from a stick-built wood frame home – or a steel frame home either – from the street. We’re reaching the end of the new home inventory here in the wonderful new community of High Point in West Seattle. Phase II is still in the early stages of planning and not all of the developers have even been selected yet. You can’t expect any homes to be available in this new phase for probably 18 months. So if you’ve been considering new construction and want a smartly Built GreenTM home – and also detest the thought of a commute from the suburbs – you need to email me and get over here for a tour. You can’t beat the views from some of the homes – as you can see here, this is last Thursday’s remarkable sunrise, as seen from my home office. I’ve lived in West Seattle for ten fabulous years and wouldn’t even consider moving away from this part of town. You need to check it out. You can’t beat the convenience to downtown, the freeways, and the airport. And you don’t ever have to LEAVE West Seattle, either, if you don’t want to. We have everything you need for great living, right here. There are two resales here in the Redwood @ High Point subassociation (Polygon construction). There is one condo suite, 2 bedrooms and 1 3/4 baths on the top floor in the center building. Click here to see the listing information. There is also one townhome for sale. It is the most affordably priced multilevel home here – it is a three bedroom two and a half bath townhome with nearly 1,700 sq ft, and comes with a 2-car side-by-side garage, which is rare in this development. There is only one other house here with a 2-car garage – and it is listed at $599,950. This is also the floorplan I have, and I can tell you how roomy this home is, with a laundry room and the bedrooms all on the same floor, and a bonus room and a storage room off the garage, and a nearly 200 square foot deck for your outdoor entertaining (or in my case, gardening) pleasure. The seller is actually wanting to move to another townhome here in High Point, one that has a small yard. But he can’t make the move until he sells this townhome, which is bargain-basement priced at $384,950. I know he has done a lot of upgrades to this home since he moved in nearly a year ago and he is taking a loss on this beautiful home. This is a condominium here and the HOA dues run about $257 for this size of home. So take a look at these homes for sale and come on out! Drop me a line (I get email on my mobile device). I would love to give you a tour of this Built Green community and the wonderful homes here. There’s nothing like talking to someone who has the personal experience of living here – I can tell you both the great things and a few of the drawbacks to living in this mixed-income community. Enjoy these photos, taken here at High Point. Some of the Saltaire townhomes. A view of our building at night, with all of the front porches lit up. Feels so California for some reason. I love the cobblestone street. One of the models – this home is still for sale I believe. One of the many porous sidewalks here, allowing for better drainage and slowing down water runoff as it heads for Longfellow Creek. The market garden at High Point – you can participate in this CSA effort and get a subscription to weekly vegetables. A Blue Angel flies by our place. A perfectly still morning allowed this great photo fo these city view homes and their reflection in the pond. The waterfall and stair way leading down to the pond. Downtown as seen from View Point Park. Another great sunrise seen from my home office. Members of The High Point K9 Club get together for a monthly meetup and walk around the neighborhood. My Italian greyhound on one of the huge rocks by the pond. A fog-covered spider web. Very beautiful. My deck garden as seen from the ground. My deck garden as seen from the top floor. I dug up everything I wanted to keep from my quarter acre lot a mile east here and transplanted it to pots. Well, I had a lot of help – from my husband Steve and our friend Steve Richmond, of Garden Cycles. 2008 tax valuations have been showing up in King County mailboxes. I haven’t received mine for our new townhome in High Point yet, but it is new construction so I suspect it will be right at the sales price. But in 2003 I fought the county assessor over the value of our former property, a 1/4 acre lot that was the last remnant of what had been a ten acre chicken farm, with a 1929 farm house on it located about a mile east of where I just moved to. The house had last been remodeled in 1967, and aside from some painting in the bedrooms and new windows on the top floor in 2002, we didn’t do a damn thing to it (another reason why we finally moved…but that was a previous post and you’ll have to dig for the true story). Seems to me when the sale of property occurs, the county goes hey wha? we better get on out there and see what’s what. They did raise the value quite a bit from the former owner’s value. I couldn’t really argue since the recorded sale couldn’t be disputed as current market value. But the 2nd year following our purchase, they jacked the BUILDING value way up. They increased the land value, too, which I am less inclined to argue with. As land becomes more scarce of course it’s value will go up. But they were not going to tell me my old farm house, that was a year older and a year closer to needing a total rehab, had gone up in value over $30k. Nosirreebob. So I took on the tax assessor. As a real estate professional, property value is something I know about. And they were overvaluing my house! Filing a value appeal is a very long process. The form is very detailed (and you have to write really small). I think it took a total of 6 months for the decision to come back – finally in my favor. It’s funny that in order to be successful at a tax appeal you need to either be a real estate agent or be really good friends with one since the most user-friendly and reliable sales comparable information (in my opinion) comes from the NWMLS (Northwest Multiple Listing Service). Maybe I am just biased. But you better have a balanced argument and know what you are talking about. Name calling is not going to work (hehe). I may have taken advantage of my home’s appearance in making sure the valuations stayed well below what the place MIGHT have sold for. But you never know how much a place is worth until you actually sell it. We bought the place in 2001 for $215k. We sold it in 2007 for $395. Now – this is highly unusual for an old farm house with a big yard. But here’s what we had working in our favor – the property was large enough to be subdivided one last time. And I made sure I told it to a local, environmentally-sensitive developer. That’s 183% on my zero investment (we had 100% financing). One of these days my dad will actually admit we did the right thing when we bought that place – not the idiots he thought when we first purchased the place when we were 31 years old. And we never would have been able to leverage our way into our current home without it. As for the county’s tax valuation, I never once argued with the county’s assessment of the LAND value. Just the BUILDING. And I think that is why we won. Twice. Last year, as I moved from a marketing position at a mortgage company to the real estate brokerage I am with today, I had the occasion to talk with Harley Hoppe on the phone in response to an ad he had for a researcher. He wanted to hire me just based on tax appeal win experience. Unfortunately for Mr. Hoppe, he hired someone else for less money first – then came back to me three month’s later wanting to know if I was still available. Too bad for him. And probably good for me since I wouldn’t have been able to focus on green living and real estate as much as I can today if I was trapped fighting the bad ol’ government on behalf of the “little people” who can afford to hire a tax attorney. Mr. Hoppe is quoted in an article today in the Seattle PI. Read Proving your home is not worth that much – Owners fight county’s assessment of property value — and sometimes win. “Cradle to grave” means many things. Here it means green life gives way to green death. Six Feet Under, or SFU to its fans, was a groundbreaking drama on HBO for five award-winning seasons. I came to the show late and ending up watching the first four seasons on dvd from Netflix, then waiting for the 5th season to come out on dvd since I didn’t have HBO or a dvr at the time either. I bring this up because I was struck with a strong plot flashback when reading Dying without killing the Earth online today via The Seattle Times web site. The character Lisa Kimmel Fisher, played by Lili Taylor, was from Seattle, an “earth mother” hippy type, always shopping at Whole Foods and caring greatly about the earth and the environment. I appreciated her character on the show since it portrayed the green lifestyle a few years before green was so popular. It was a mystery for a long time what happened to her, her disappearance, later finding her body – and Nate, played by Peter Krause, going to great lengths to honor her wishes for an “ecoburial”. He had to sneak out to the woods late at night and dig her grave himself. There was some humor thrown in to lighten the moment, but this show is beyond description so I won’t go any further than that. Except you should watch it. It’s available on Netflix. Eternal Reefs is another way to go. There is mention of it in a related article. This is my personal choice. I learned of ER several years ago and recently learned, after pestering them for a long time, that there are plans for memorial reefs off the West coast as well. See, I was meant to be an oceanographer. But when I tried diving at Underwater Sports as a freshman at the University of Washington School of Oceanography, my inborn fear of the water kept me from being able to stay under. They recommended private lessons, hypnotherapy and lots of counseling to be able to overcome my fear and learn to dive. Of course, at the age of 18, with little money, that wasn’t going to happen and eventually I quit classes and joined the military (only to be sent home with a bad knee – and thus began my career in property management and real estate). So the only way I am going to be able to see the fabulous underwater world and study those beautiful fish and the reef world is to BECOME part of a reef. GPS will be the only way to locate your remains under either method. Funny, that’s also how I find real estate these days! Got too many pots? Plan ahead for a trip to Woodinville on Saturday, October 13th. It is plastic garden pot recycling day at Molbak’s. Bring your empty plastic growing pots to the Molbak’s recycling station (located just inside the nursery entrance) and receive a same-day in-store credit to be used toward your purchase for this day. Please have your containers free of soil, leaves and debris. Join the imcomparable, Ciscoe Morris, as he gives us his great gardening tips for cleaning up fall and prepare our yards as we approach winter. Come with your questions and maybe you’ll be a prize winner!